The painting Almond Blossom by Van Gogh (1853-1890) probably is inspired by Japanese prints with their attention for natural detail. The work stems from his last period when he was, from May 1889 onwards, institutionalized in St. Rèmy-de-Provence. At first he paints in the garden of the institution, later also outside its premises, in a ‘somewhat more softened use of colour’ than the ‘high yellow note’ of Arles in the preceding period. In Arles, where Van Gogh lived from February 1888 till May 1889, he had painted many blossoming fruit trees. As the trunk is missing, Almond Blossom was perhaps painted inside. Its composition differs from that of his earlier fruit trees. What does the painting show us? The first thing catching my attention were the softened colours. The branches are not set off against a dazzling and bright blue, the blue of the sky is rather turquoise or aquamarine. The paint is heavily applied, which has the effect of thick, not thin, air. The somewhat knotty branches are green-blue as well. The blossom contrasts with the thick air and branches. The blossom is white-pink-green of colour with here and there a thin red rim, the pistils are yellow. Around the still closed and swollen buds light green leafs are folded. From a distance the little flowers look pink and fragile. Around the blossom the canvas shines through the paint, which accentuates the delicacy even more. The whole is a subtle play of colours. The blossom in its light and fresh frailty is the symbol of a new spring and budding new life. It is the frailness of that life that catches the eye. The picture awakens longing for the summer, for the full life, while also bearing the promise of more as the blossom is the first messenger of harvest. The branches of the almond tree will bear fruit. Thus, the painting acts as a parable. It makes clear that the present world is not final. A shimmer of eternal life is already shining through. Van Gogh was not able to live by this parable. 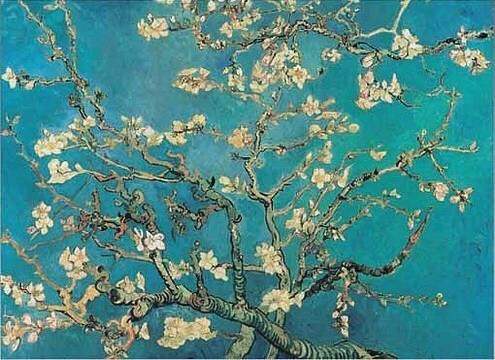 He went crazy in his struggle to paint the light and committed suicide a few months after he completed Almond Blossom. The parable no longer was an orientation for him in this world in which eternal life can only be known by parable. His struggle for the light ended in self-chosen death and blindness. Vincent van Gogh: Almond Blossom,1890, oil on canvas, 73.5 x 92 cm, Van Gogh Museum, Amsterdam. Published in Marcel Barnard: Wat het oog heeft gezien. Verbeelding als sleutel van het credo. Meinema – Zoetermeer, 1997. Prof. Dr. M. Barnard is Professor of Liturgical Studies at the Protestantse Theologische Universiteit (Utrecht) and at the Free University of Amsterdam. His website is www.pthu.nl/mbarnard.